Cheer up Japan through the Internet.  MEDIAWAVE Inc. is a website management-consulting firm in active operation in Japan. The dissemination of Facebook and Twitter is making the world virtually borderless. English-speaking and Chinese-speaking regions with their services. but also in the rest of the world. Copyright©2004- 2013 海外のホームページ作成｜㈱メディアウェイブ All Rights Reserved.